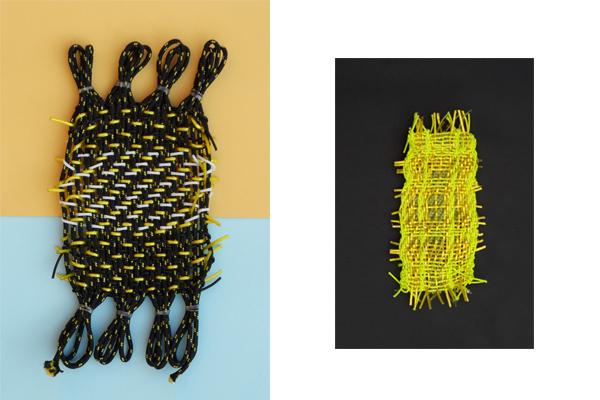 In a fun way, designer Tamara Verbruggen experiments with of unconventional materials in combination with traditional weaving techniques. Because of her fascination with colour and patterns, samples are created that are most suitable for interior products or fashion accessories. Verbruggen gets her inspiration from different cultures. For her graduation project at the Maastricht Academy Fine Arts & Design, she started her research into tartan with a modern twist, inspired by the textures and patterns from the existing Scottish tartan. The colour combination that is visible in tartan eventually led to her interest in optical illusions in weaving. By combining a traditional weaving technique, the 2/2 twill weave, with various materials she puts the Scottish tartan into new perspective. She uses the colour theory of artist Josef Albers as her guideline. In his research, Albers studied the way in which colours react to each other. He studied the balance of colour, rhythm and materials in weaving.